I totally disagree with you Thibaud. Dual browser panes in XnView would rock. but what about making xnview rock right now ? with it's current feature set. You'll certainly agree with me that a good part of "making it rock" goes into the way features are implemented rather than the feature itself. I believe that's precisely what xnview needs at this point. Also, there is a dual pane browser plugin for Firefox called called Split Browser (search the Mozilla add-on site) that is very cool. I use it to put a full Google search results page on the left and a regular page on the right. Clicking a search result on the left displays the target page on the right. This works better than side bar search because the results are not truncated horizontally. Any chance / plan to add this feature in the MP version? It's very important feature for me. Perhaps it would be easier to implement it in the MP version? It would be great to have exactly this identical functionality in one (1!) 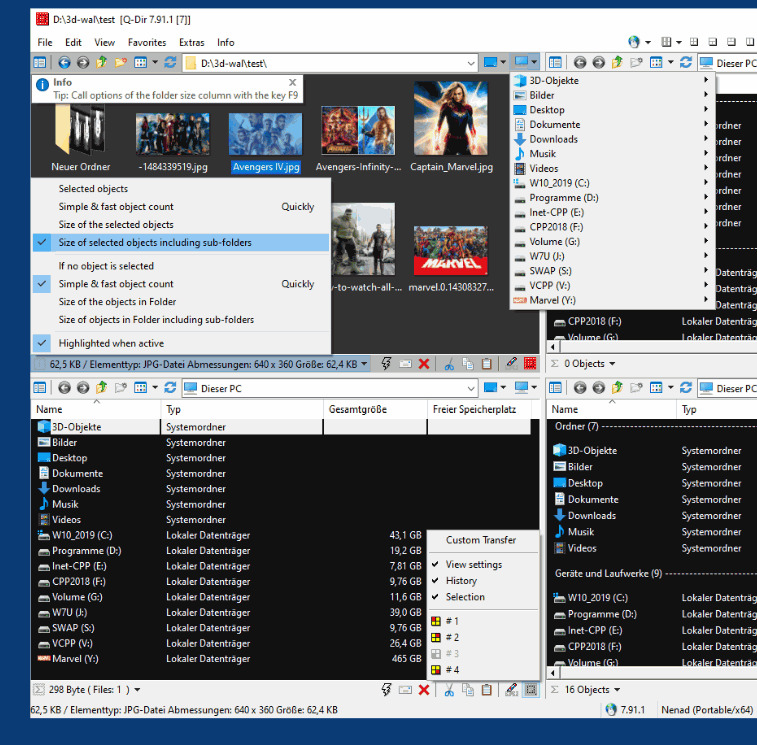 XnView container window plus a customizable toolbar on the splitter between the two panels housing various button controls such as copy, move, compare panels, synchronize locations, synchronize layouts, etc, etc. The amount of time such a configuration would save me is huge. When we are just looking at images, or working on a few of them, one browser is enough. But when we start managing 1000's of images in 100's of folders... well, one browser view at a time is an impediment. The problem with my approach is that the two XnView instances know nothing about each other, so they cannot interact productively! I was talking about a similar topic with someone the other day (professional digital artist) who was complaining that the Adobe Illustrator interface had oodles of functionality, but was so labor intensive to use (due to poor GUI design) that it was costing him money every time he moved the mouse to that toolbar way over there on the left of his 30" wide-screen monitor. It's not that XnView is poorly designed (far from it! ), but that it (and EVERY OTHER image browser) is less than optimally designed for some of the tasks some of us need it for. Take my word for it, using TC, or FreeCommander, or Dopus, or any other of the dual-pane file commanders (even with thumbs support and folder tabs etc etc etc) to manage images frankly stinks compared to using XnView. Even the crude "two instance" manner that I employ is better than using TC to manage images, even considering all of TC's incredible dual-panel utility. The thing about dual browsers in XnView is that they could be a "discoverable" layout in the layout list that would be off by default. As a programmer I know it is mostly a matter of frames, linked lists, and pointers into the heap. It would not be like doubling XnView's file size or complexity or anything like that. Well, obviously memory footprint would increase. Can't help it, I'll always hope for this. It would blow many user's minds (in a good way) to have dual pane functionality in an image browser. I'd write my own, but I'm too old now. Dreamer wrote: Great reply John! It would be unique feature, I don't know any image viewer with this, but it's a big feature so probably too late for the next version. Those who use file manager can't live without it, those who would try xnview with this feature would can't live without xnview. I think it would be an interesting feature for XnView MP. I am aware of Zoner. My request for dual browsers in XnView (or just MP) is for two complete browsers, not two thumbnail panels, which is how Zoner does it. 1. No explicit linkage between pairs of browsers (ie. Source/Destination, as in dual pane file commanders). 3. Only one preview pane for all browsers in tota, instead of one per browser. There are many other things I don't care for in Zoner, but they aren't really relevant to this discussion. I'd miss also hundreds of other XnView features in Zoner Photo Studio. I doubt it's possible to copy the images to other pane with a single key and without any dialogs (as in FreeCommander for example - F5). Furthermore - it's not free. MP version is my hope for dual pane image browser. I know a similar feature is planned, Pierre wants to add a bin, or such a thing / feature, it would be another pane / list of files, so why not use it for more features? - Add Layout "FolderTree on the right"
.... what Do you think? Im new to this discussion and havent read through it all, but I support a mulitple pane solution. When working in XnView, I always need to jump between multiple folders back and forth. I often long for one extra (or two?) panes, it would ease up my workflow dramatically. I dont consider this an extremely essential feature, and I suspect it could be hard to implement, but it would do a lot good. Multiple tabbed browsers could be an alternative (like in Opera web browser). Very interesting solution! Especially for simply rearranging and sorting the files. That site has quite a bit of interesting stuff! QDir even offers a 3-panel layout, something I never thought of before but which could be very useful!